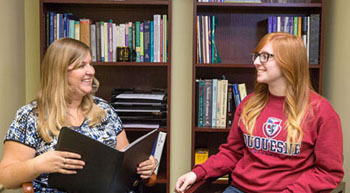 While rigorous and challenging, the atmosphere for the PB-PMHPP students at Duquesne University is supportive and positive. This small and intimate program, with enrollment varying annually between 10-25 students, provides all PB-PMHPP students with individualized advisement, personalized curricula, counseling, and support. The PB-PMHPP advisors assist students in identifying strengths and weaknesses in their professional preparation and experiences and provide guidance to help the students identify and secure appropriate opportunities to improve their professional portfolios. PB-PMHPP students are expected to be actively engaged in their own development and preparation, and it is the responsibility of the students to identify professional schools they hope to apply to and become knowledgeable of the unique requirements of those schools. This information should be shared with the PB-PMHPP advisors, so that they may better assist the students in their preparations. Only students enrolled in the Certificate Program will receive enhanced advisement and support including, but not limited to professional school application preparation and submission for up to 3 years following completion of the program. Certificate students applying to medical and dental schools who meet the Duquesne eligibility requirements will be granted a Duquesne University endorsement/committee letter. Non-Certificate students will be assisted with the application submission process, but will not be eligible for the Duquesne University endorsement/committee letter nor services beyond the time of enrollment in the PB-PMHPP.